In this highlight of the new Bexar County Sheriff’s Office commendation medals,Celebrate Excellence interviews Sgt. Stephanie Flores to uncover just what makes her agency stand out. There’s a lot at the “BCSO” worthy of special commendation, from their unique officer training programs to the opportunities offered for career advancement. With the creation of new commendation medals, the BCSO possess a line of medals truly worthy of the bravery and sacrifice displayed by their officers every day. The mission statement of the Bexar County Sheriff’s Office is to build a better community through quality services. They describe themselves as a results-oriented organization characterized by accountable, professional, and innovative leadership. Responsible for patrolling the 17th most populous county in the United States (the fourth largest in Texas), the Sheriff’s office law enforcement bureau is quite extensive. Divisions under this umbrella include Criminal Investigations, SWAT, and K9. With their new line of commendation medals, outstanding individuals from every level of service can be recognized for their achievements. 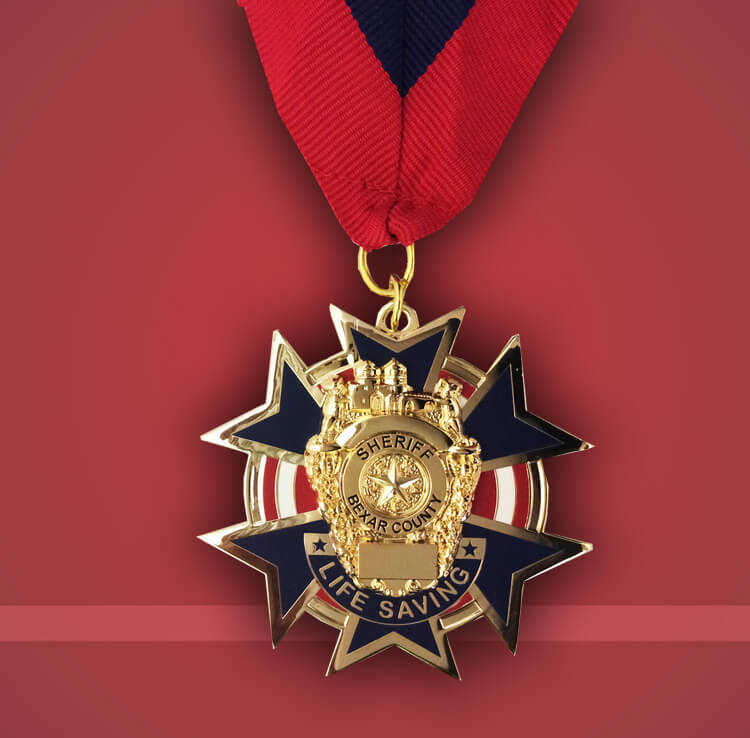 This line of commendation medals includes the Medal of Valor, the Purple Heart, the Meritorious Service Award, the Life Saving Award, and the Citizen’s Meritorious Medal. 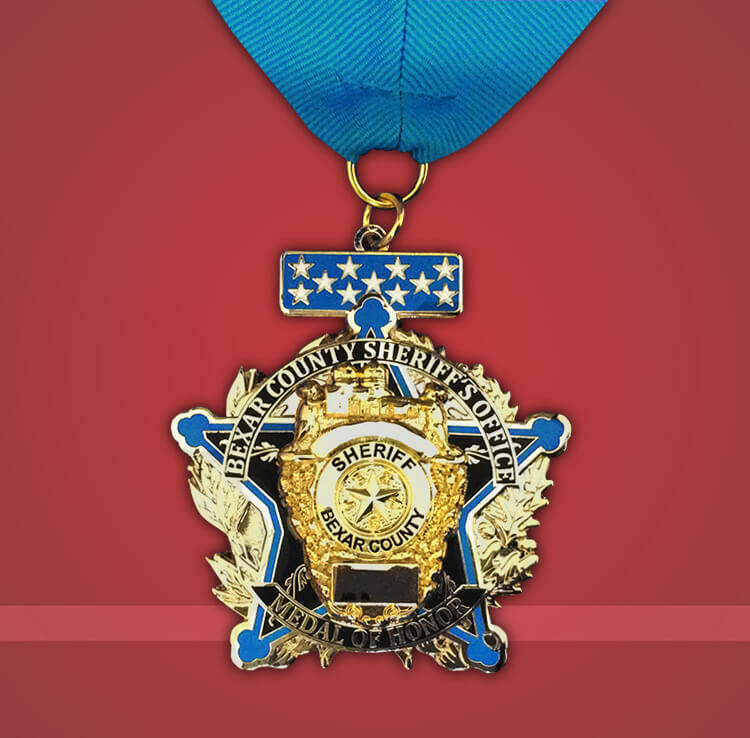 Measuring in at two-and-a-half inches, featuring unique designs created specifically for the Bexar County Sheriff’s Office, they are medals and lapel pins that anyone would be proud to wear and display. We at Celebrate Excellence are proud to have created such incredible accolades in conjunction with the Bexar County Sheriff’s Office. My name is Sgt. Stephanie Flores. I’ve been with the Bexar County Sheriff’s office for about eight years, now. I am the Sheriff’s administrative sergeant for special projects. The Sheriff’s office here at Bexar County, we are one of the largest, we have approximately 1,500 deputies. We have a very significant amount of those deputies, are working within our jail, our facility. The Bexar County Sheriff’s Office, I believe, is a very significant or special department because each and every one of our deputies has to start within the jail as a detention officer. And that, at that point, they’re given the insight of what a criminal mind is like, and what these people out on the streets are like, so that when they do then transfer onto patrol, after being in the jail for two years, they’re better trained, they’re better prepared, they understand the mindset and they also know exactly what people they’re dealing with because they’ve already dealt with them before. So I believe that our officers are superior. My significant hope, or what I think about every single time I look at these medals, is my officer’s morale. The deputies’ morale. I think that this is something that will encourage them to go above and beyond, to earn those medals, but I think that there’s been so many times that these officers have done their job far beyond what is asked and they have just not been recognized and I think that is something that hurts morale. I feel like with this particular program and how we’ve gone above and beyond to design these weighted and significant medals for them that this is going to drive them to push harder and work harder and want to have that recognition, to wear that pin with pride on their uniform every single day. And not just ‘put this uniform on because I’m going to work,’ but ‘put this uniform on with pride,’ knowing that you’re making a difference in our community. I think a better question would be “How do they not differ?” — they are significantly, there’s a significant difference in each medal. The medal previously were about a quarter of the size, very light in weight, very…I can’t choose to use another word other than saying “basic”. These particular medals that we’ve designed with Celebrate Excellence are weighted, are eccentric, specific, something that anybody, anybody, would be proud to wear and display, and receive.I would like one, personally. I think one of the most unique things about the Bexar County Sheriff’s office is that whether you decide to stay within the detention facility or whether you decide to be patrol, the sky is really the limit. We provide training, we provide several different departments that you can go to, booking, classification, warrants, CID, homicide, K9, SWAT, undercover!There’s just so many opportunities and every single opportunity is presented to the officer. You can rank up to corporal within two years, rank up to sergeant within four. Lieutenant within six. The sky is the limit! It doesn’t matter what you want to do, all you have to do is decide. We’re giving you every single opportunity, not just to have a job, but to have a career. I think that’s what makes us different, that we have so many different paths to choose from. So whether you decide to just stay complacent, stay as a detention officer, then that’s your decision, if that’s the dream then that’s the dream. But if you have other dreams and aspirations, they’re there for you. And I believe that that makes us extremely unique amongst several different agencies.